9 minutes of footage from Peter Sloterdijk’s talk (although it was an interview..) at Felix Meritis where the Dutch translation of his Du Musst Dein Leben Ändern was officially presented. A double booking for this Fridag evening, I’m afraid. At exactly the same time as W139’s Allegories of Good and Bad Government will take place, Peter Sloterdijk is giving a lecture on his new book entitled ‘Du Musst Dein Leben Ändern’ (‘You Must Change Your Life’) at Felix Meritis. For some time now – a first draft was posted on July of this year – one can find Latour’s Compositionist Manifesto on his website. Or, as himself has titled it, ‘An Attempt at Writing a ‘Compositionist Manifesto’. Between pages 372 and 396 of Spheres: Foam, Sloterdijk speaks of houses and homes as modern immunesystems. Given his topological ontology he is able to speak of appartments as being the manifest examplifiers of being as being-with and being-without, as the physical incorporation of the outside (inclusive exclusivity) Despite this phenomenological distant way of speaking, we can imagine that, when we think of contemporary lifestyles, there exists a existential difference between inside and outside. Modern man isn’t living in a worldorder, in a meaningful cosmos, but is able to position himself ‘against’ the world by explicating his own life as a sum of choices. Sloterdijk envisions housing as the material manifestation of this modern thought, but at the same time underlines that it’s not an apparantly post-historical way of thinking; lifestyles, interior design can be seen as the modern longing for protection, to be ‘inside’. So in a way modern housing is a continuation of the hyperbole of classical metaphysics (378), that is; the cosmos as a Home, a Womb. What has changed it the fact that being inside means being-with-oneself and incorporating the outside. Or, what has come into being is the entirely horizontal way of living. When Sloterdijk looks at the home as a living-machine he means that the transcendental (the vertical) has been made material between four walls. This is the time of immanence, of horizontal meaning, of being-with as being-without. It’s interesting to see all of this in the light of Sloterdijk’s remark that the living-machine presents itself as a moving-house-machine; the four walls exist without a context (385). So, according to Sloterdijk, a house isn’t being ‘lived in’ anymore but it’s ‘dwelled in’, ‘remained in’. ‘It’s a deterritorialized container which doesn’t demand or allow essential environments. The word ‘nearness’ frees itself from it’s trivial-spatial interpretation.’ (389) So there are two things happening; the house becomes a residence / the given fact of four walls are enough to make a horizontal living / man incorporates the outside inside a context-free ‘in’ness. 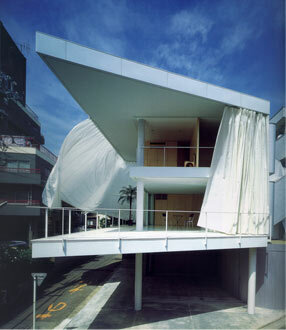 It seems to be especially interesting to think about contemporary pre-fab designs and houses. ‘The mobile home manifests itself as walking architectural monad (..) the house and the owner appeal to freedom of context.‘ (389) We could go as far as saying that houses are not being built by setting up walls, but are being installed by fitters. Nevertheless, we are not forced to agree with Sloterdijk that modern architecture isn’t a reconciliation of man and nature. Where Sloterdijk mentions water, electricity, sewege etc. as minimum, we could mention sustainability as a sur plus. We’re not letting loose here of Sloterdijk’s exaggerated phenomenology, but are trying to reduce his pessimism. Pre-fab sustainability could be seen as a reconciliation of inhabitant and environment. Being-in doesn’t mean excluding the outside, but being-with-the-outside. Although this is playing with words, it’s interesting to think about the existential consequences (in Sloterdijkian fashion) of pre-fab and sustainability. We still have the Earth as Home, as Womb, but we can let go of the pessimistic individualism or excluded living. What does it mean to move into a pre-fab house? How does this alter the relation between inside and outside? Between the plural and the unity? Nevertheless, Sloterdijk gives a thoughtful insight in modern living, but he should take into consideration the consequences of pre-fab sustainability. I will try to find some articles discussing this theme in the following days.